Synopsis: Treasure hunters find a tribe that is performing voodoo rituals at the behest of a mad scientist intent on creating an indestructible creature. Somewhere in Los Angeles, a group of B-movie actors pause in their ineffectual hacking with blunt machetes at a cheap jungle set to gaze skywards at monkeys frolicking in treetops thousands of miles away. The image of the actors is clearly defined, but the monkeys are hazy and slightly blurred. That can mean only one thing: we’re in the land of the cheap, the 1950s drive-in B-movie, a place designed for those who want a little background noise while they’re necking. Who cares if the quality of shots doesn’t match? Hardly anyone will watch the damn thing once its theatrical run has finished, anyway. Voodoo Woman was shot by Edward L. Cahn, a director of Polish descent who thrived within the milieu of tawdry second features. He made 30 movies in the 1950s (in 1960 alone he would direct nine!) 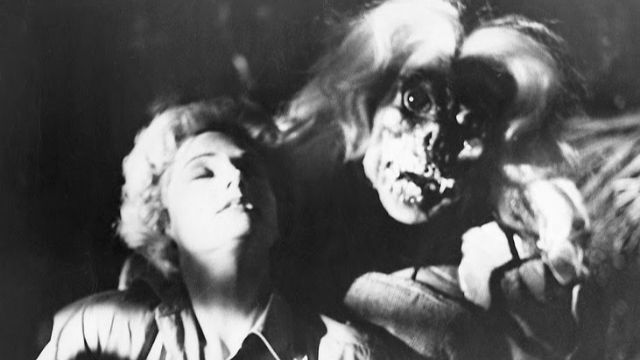 with lurid titles like Creature with the Atom Brain, Zombies of Mora Tau, and Invasion of the Saucer Men, all of which were terrible movies that were capably enough directed considering the tight deadlines, minuscule budgets and largely second-rate, past-it or inexperienced actors with whom he worked. Voodoo Woman can at least boast a memorable performance from 22-year-old Marla English (Rear Window), a decent actress who had just two years earlier unknowingly sabotaged her promising career by pulling out of The Mountain, a movie she was due to make with Spencer Tracy, after falling ill from a smallpox vaccination. English plays sultry femme fatale Marilyn Blanchard, who looks good enough to eat but is poison to the core, as two men who come between her and a fortune in gold discover to their cost. The gold belongs to a remote tribe in the jungle, so once she has acquired the map revealing their location, Blanchard hires Ted Bronson (a young Mike Connors – Where Love Has Gone – when he still went by the name of Touch) to show her and boyfriend Rick (Lance Fuller – This Island Earth, The Andromeda Strain) the way. But what she doesn’t know is that mad scientist number 1342 Dr. Roland Gerard (Tom Conway – I Walked with a Zombie, Peter Pan) is already tight with the tribe’s chief who, despite his doubts, is using voodoo magic to help the doctor transform one of a neighbouring tribe’s native girls into an indestructible scaly monster. Apparently, Alex Gordon’s fiancé was so dismayed by the quality of his work on Voodoo Woman that she temporarily called off their engagement. That might have been something of an over-reaction, but there’s no denying that Voodoo Woman is a very poor movie which is redeemed only in part by English’s blistering performance. Conway looks as if he’s battling a hangover in every scene in which he appears (it would be only a few years before he would be calling a $2-a-night flophouse home) and has to suffer the indignity of wearing the silliest of hats each time he watches the chief performing his ritual. It’s the kind of movie that exists solely to be sneered at, but Voodoo Woman isn’t without some modest charms; in fact, the first twenty minutes or so are passable enough – the atmosphere in the jungle saloon in which the early action takes place is agreeably sleazy, and English’s earthy sexuality and unbridled greed are entertaining – but it’s when the mad scientist plot takes centre-stage that things fall apart.